Many of the front pages have pictures of the effects of Storm Ophelia. The Guardian and the i show crowds watching as huge waves crash into the harbour wall and lighthouse at Porthcawl in south Wales. "Rage of Ophelia" is the headline in the i. For the Star, it's "Hell Storm". 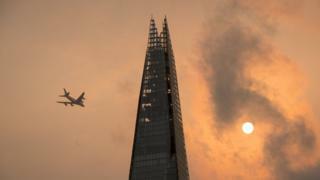 The orange skies produced by the dust and debris blown in by Ophelia are widely featured. It was, the Mail says, the day Britain turned orange. The Times and the Sun describe the phenomenon as "Red October". According to the lead in the Times, new peerages will have a 15-year time limit under a plan to shrink the House of Lords. The proposal is being put forward by the Lords committee given the task of cutting membership of the chamber. Its report - to be published later this month - will also call on political parties and crossbenchers to commit to reducing their numbers in stages, the paper adds. An apparent plan by the Chancellor, Philip Hammond, to carry out a Budget raid on older voters to pay for tax breaks for younger workers goes down badly. Ross Clark in the Daily Express describes it as "madness". He says the idea, which would promote "inter-generational fairness", ignores the plight of pensioners who have lost out on interest on their savings for nearly a decade. The size of the House of Commons is the focus of the Telegraph's main story. It concludes that had the latest Boundary Commission review of parliamentary constituencies been implemented in time for the election in June, the Conservatives would have won an overall majority. The review would also have delivered on a government pledge to cut the number of MPs by 50 - and the paper's leader column says a smaller House would ensure fairness, giving every constituency a roughly equal number of voters. The Daily Mail's lead says cannabis growers are routinely being let off by police. Even those cultivating plants potentially worth tens of thousands of pounds are escaping with cautions, it adds. A spokesman for the Police Federation, which represents rank and file officers in England and Wales, tells the paper that forces have to prioritise crime. "Looking at drugs, we have to put the most resources into tackling the ones that cause the most harm to society, and they are not cannabis", he says. The Sun reports that Crimewatch has been axed after 33 years. It says BBC bosses are thought to have pulled the plug on the show because of falling ratings - and they also want to spend more on dramas instead. But, the paper adds, the decision is expected to cause anger among police forces. In response, the BBC says the move will allow it to create room for more innovative programmes in peak time - but Crimewatch Roadshow, which is shown during the daytime, will continue.